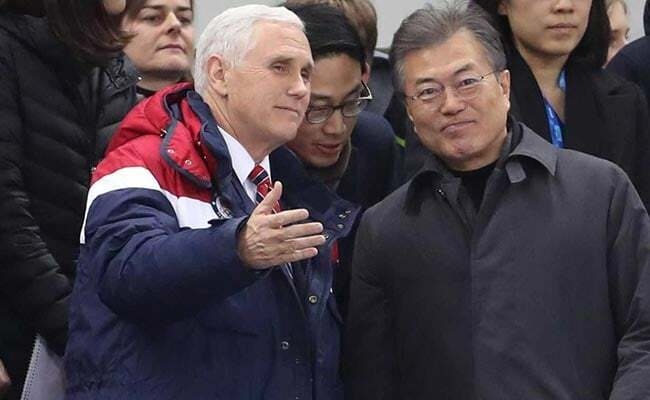 SEOUL/WASHINGTON: Comments by U.S. Vice President Mike Pence suggest the United States may be looking more favourably at diplomatic engagement with North Korea as South Korea considers a rare summit with its neighbour and long-time foe. Pence said in a newspaper interview the United States and South Korea had agreed on terms for further diplomatic engagement with North Korea, first with Seoul and then possibly leading to direct talks with Washington. The prospect of talks comes after months of tension between Pyongyang, Seoul and Washington over North Korea's nuclear and missile programmes, with U.S. President Donald Trump and North Korean leader Kim Jong Un trading insults and threats of destruction amid tightening sanctions from the United Nations. Speaking to the Washington Post aboard Air Force Two on his way home from the Games, Pence said Washington would keep up its "maximum pressure campaign" against Pyongyang but would be open to possible talks at the same time. "The point is, no pressure comes off until they are actually doing something that the alliance believes represents a meaningful step toward denuclearisation," Pence was quoted on Sunday as saying. "So the maximum pressure campaign is going to continue and intensify. But if you want to talk, we'll talk." U.S. Secretary of State Rex Tillerson said on Monday it was too early to judge whether latest developments represented the start of a diplomatic process. "We've said for some time it's really up to the North Koreans to decide when they're ready to engage with us in a sincere way, a meaningful way," Tillerson told reporters in Egypt. Trump has at times questioned the purpose of further talks with the North after years of negotiations by previous U.S. administrations failed to halt the North's weapons programmes. Relations between the two Koreas have improved in recent weeks, with Pyongyang sending its highest ranking delegation ever to attend the Winter Olympic Games, being held in the South Korean resort of Pyeongchang. A South Korean government official said Seoul's stance was that separate talks with North Korea by South Korea and the United States should both lead to the denuclearisation of the North while sanctions and pressure continue to be applied. North Korea defends its weapons programmes as essential to counter U.S. aggression, saying regular war drills between the United States and the South are preparations for invasion. The South hosts 28,500 U.S. troops, a legacy of the 1950-53 Korean war. South Korea said it would seek ways to continue engaging North Korea, including trying to arrange more reunions for families divided by the war and lowering military tensions. "(The visit) shows that North Korea has a strong will to improve inter-Korean relations and that Pyongyang can make unprecedented and bold measures if deemed necessary," the ministry said. The visit of the delegation, which included North Korean leader Kim Jong Un's younger sister, Kim Yo Jong, intrigued many in South Korea, but also met scepticism about the North's willingness to give up its pursuit of nuclear weapons. North Korea has said it will never give up its nuclear deterrent and critics in the South see its participation in the Games as a reward for bad behaviour. Kim Yo Jong and her delegation spent three days dining with top government officials, watching the opening ceremony and cheering for the united women's ice hockey team the two Koreas have fielded at this Olympics.